The C&IT Corporate Forum takes place from 25-26 January, register your interest now. 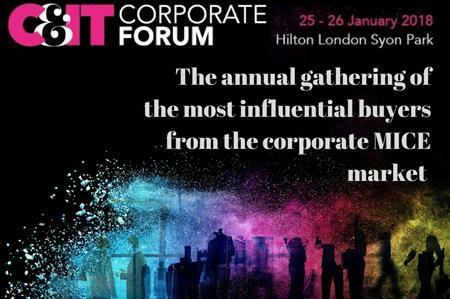 The C&IT Corporate Forum will return on 25-26 January 2018 at the Hilton London Syon Park and will once again bring together some of the most influential senior in-house corporate MICE event organisers and suppliers for a packed two day event. Industry-leading delegates and suppliers will meet to discuss key challenges facing the MICE sector during a packed two-day event. There will be pre-arranged one-to-one business meetings and networking opportunities throughout the event in the perfect setting of the Hilton London, Syon Park. Highlights from this year’s agenda will include: expert panels tackling the industry’s big challenges; case studies from industry peers; and discussion huddles on technology, marketing and content. For more information, visit the forum site: www.cit-corporate.com. The C&IT Corporate Forum is a hosted buyer event. There are a limited number of complimentary places available for senior corporate buyers. If you are interested in joining us at the 2018 Corporate Forum, register your interest today. If you're a corporate and would like to get involved, please email jennifer.pham@haymarket.com for speaking opportunities.